ECONRAM SYSTEMS LOWEST PRICE GUARANTEE! We are so confident that we have the lowest prices available that we are offering the EconRam Systems Lowest Price Guarantee. The EconRam Systems Lowest Price Guarantee makes sure you buy your products from EconRam Systems at the best possible price. We will beat lower prices advertised by authorized dealers located in the United States, including prices advertised on the Internet. The advertised item must be of the exact same brand and model as the purchased product, must be new and factory sealed, and subject to a manufacturer's warranty applicable in the United States. 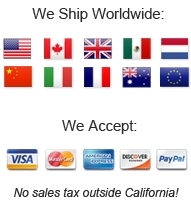 Advertised prices must be in U.S. dollars, and will be calculated to include all charges applicable for delivery to your home address (When comparing online or phone pricing, please include and refer to companies shipping prices - Also, many people are not aware of this but many companies charge a percentage for using a credit card (2-4%) and we do NOT charge this. Please factor this in when comparing prices - When shopping from EconRam Systems there are NO HIDDEN FEES). Advertised items must be current prices and not applicable in the future or expired. The EconRam Systems Lowest Price Guarantee does not apply to advertising errors or misprints, special educational prices, restricted offers, mail order offers, rebates, coupons, premiums, free or bonus offers, OEM products, gray-market, shipping charges, limited or minimum quantity or limited time offers, close-outs, liquidations, clearances, and special financing offers. The terms and conditions of the Lowest Price Guarantee are subject to change without notice. EconRam Systems may refuse to process an EconRam Systems Lowest Price Guarantee request at our discretion. By submitting a request you agree to these terms and conditions.